The project is concerned with rejuvenating an old Art Deco bank (turned Red Rooster) building with many original features and providing a new ‘sister’ venue for St.Kilda’s Cicciolina restaurant. Whilst context, history, memory and locale influenced the design, it was as much about the notion of interpreting new opportunities for a 20 year single operative establishment. So then evolves something fresh and different yet familiar and even cosy. 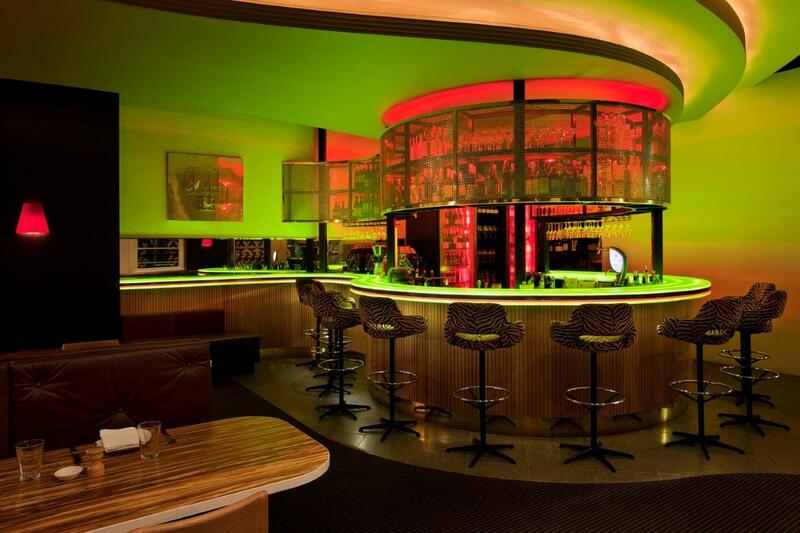 A chance to combine interior design with an iconic building, client with context, not to mention the patrons. A lounge, a salon, perhaps cocktail bar or fine dining restaurant. Neither nor but never a bore. It is this overlap and conjunction of style, type and operation that reflect and define a contemporary position. As a design with layers of reference, interpretation and meaning which was nurtured into something new, we aimed to express, to sample, to provoke and above all to enjoy. 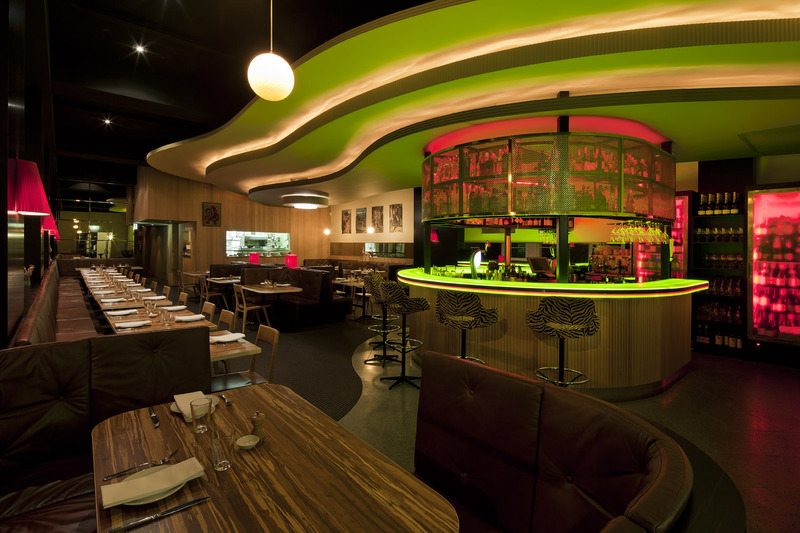 It is an interior of luscious materials, a swirling combination of light and dark, of colour and texture. Delivered with stylistic overtones from the 1920’s on, the enveloping curved forms and generous appointments invite and entice. 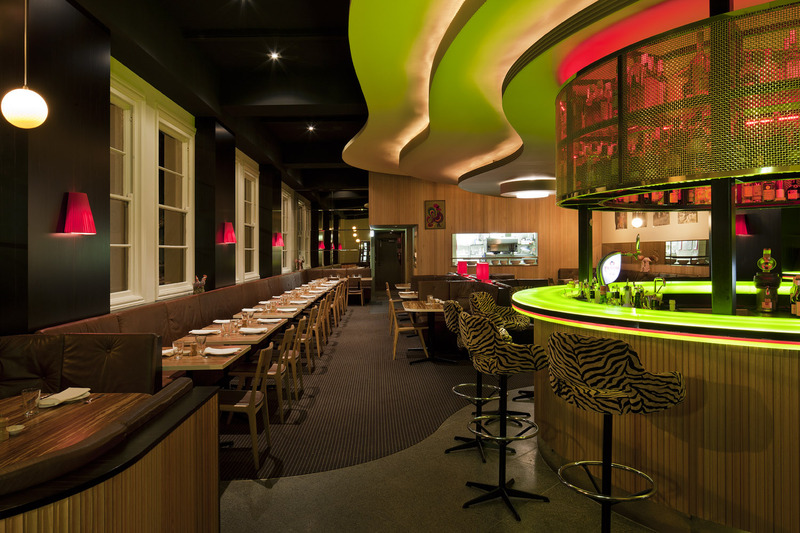 From the generous brown leather booths and banquettes to the backlit green polymer circular bartop lined with its swivelling zebra pattered stools, a rich combination of form and material was paramount. Carpet and terrazzo underfoot yield to fluted timber wall and bar lining, bevelled mirrors and a dynamic stepped curvilinear ceiling. A boudoir red is expressed in fabric lamps and backlit brass mesh above the bar. 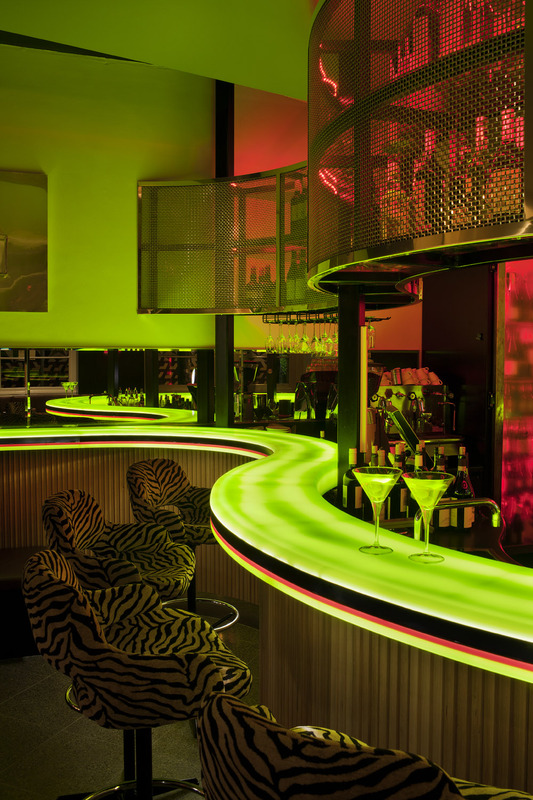 Drinks tend to glow, red in the fridges and display shelves or greenish atop the bar, that martini somehow energized. Tiger striped bamboo table tops adorn dining surfaces while pink flamingos and various chickens somehow pop up here and there, courtesy of the clients decorative inspiration.